Sunday August 22nd 1920 Rob, Cora and her Uncle went for an all days picnic. The rest of us were home most of the time. I was down to Otts. I inquired about a trip north. We all spent the evening together in the little sitting room. 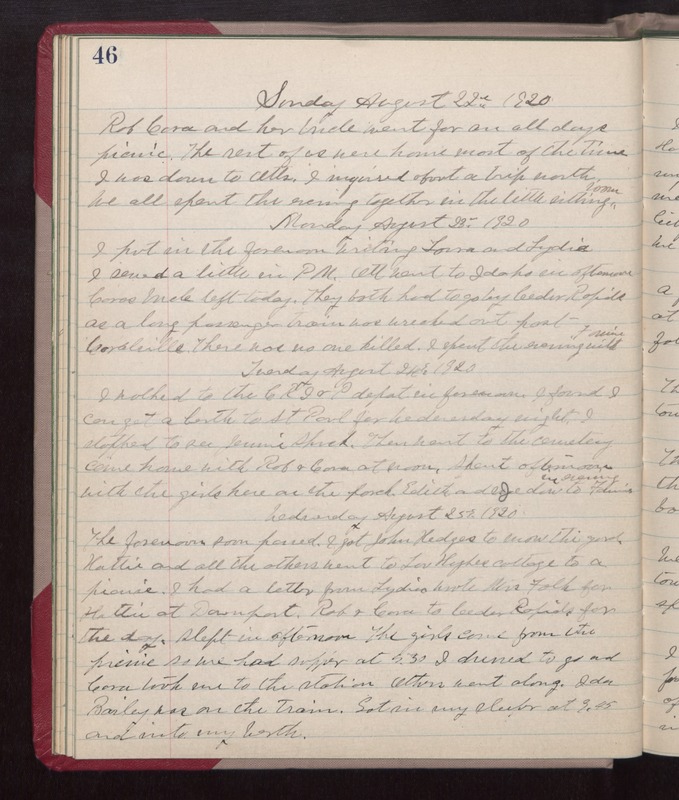 Monday August 23rd 1920 I put in the forenoon writing Laura and Lydia. I sewed a little in PM. Ott went to Idaho in afternoon. Coras Uncle left today. They both had to go by Cedar Rapids as a long passenger train was wrecked out past Coralville. There was no one killed. I spent the evening with Fannie. Tuesday August 24th 1920 I walked to the C R I & P depot in forenoon. I found I can get a berth to St Paul for Wednesday night. I stopped to see Jennie Shuck. Then went to the cemetery. Come home with Rob & Cora at noon. Spent afternoon with the girls here on the porch. Edith and I down to Fannie in evening. Wednesday August 25th 1920 The forenoon soon passed. I got John Hedges to mow the yard. Hattie and all the others went to Lou Hughes cottage to a picnic. I had a letter from Lydia, wrote Mrs Falks for Hattie at Davenport. Rob & Cora to Cedar Rapids for the day. Slept in afternoon. The girls came from the picnic so we had supper at 5.30. I dressed to go and Cora took me to the station. Others went along. Ida Bailey was on the train. Got in my sleeper at 9.45 and into my berth.